The Kambri redevelopment is set to be fully completed in the next four months, and retailers are beginning to be announced. Here’s what we know about the changes so far. Work has started to fit out the new bookshop and textbook supplier, Harry Hartog, as well as the new health and medical centre. The buildings have reached their final height, and stone and brick façades will soon be put in place. The development is running “to time, and on budget”. Marnie Hughes- Warrington, the Deputy Vice-Chancellor (Academic), told Observer that the first building will be done on 2 December, and the last on 30 January. One building is running two weeks behind due to the flooding in February. Harry Hartog was the first retailer to be announced, last week, and Hughes-Warrington confirmed that the bar will be the next announcement. The names of other retailers will be released through late September and early October. SA5 will also be named in October. A Lendlease spokesperson previously assured Observer that the project would be fully completed by 1 February 2019. ANU has announced a number of businesses that will be in Kambri: Harry Hartog, Club Lime gym, and the National Health Co-Op (NHC). Hughes-Warrington told Observer that 42 of the 45 shops to be in Kambri have been filled so far. Observer asked a variety of Pop-Up retailers whether they would be in Kambri. 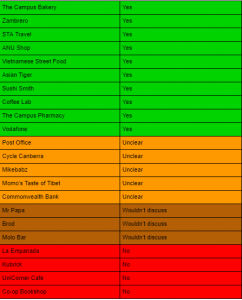 These inquiries indicated that UniCorner Cafe, La Empanada, and Kubrick will not be in Kambri. Both La Empanada and Kubrick told Observer that they would not be moving to Kambri because of the high rent prices. Hughes-Warrington told Observer that the bar will be the next retailer to be announced, but that most of the retail announcements will take place across the last week of September and the first week of October. Hughes-Warrington discussed a “pyramid” of food retailers in a blog post, with many options at cheaper prices and fewer expensive retailers. She told Observer that the “vast majority” of food options will be between $4 and $10, but that there will be a fine dining restaurant at the “tip of the pyramid”. The Kambri precinct will be “diverse not just in terms of diet, but culture as well”, according to Hughes- Warrington. She notes that “(r)etail food options are checked against the pyramid for price, for variety, and for time.” Lower parts of the pyramid involve faster ‘grab and go’ options. By contrast, in June, Vice Chancellor Brian Schmidt would not clearly answer what sort of meal could be considered “affordable”. 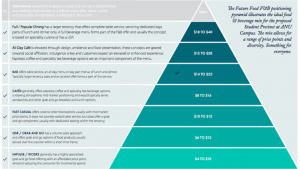 Hughes-Warrington did not provide details on what sort of food options $4-$10 would get a student, though the pyramid indicates that retailers at this price try to encourage an “incremental spend”. 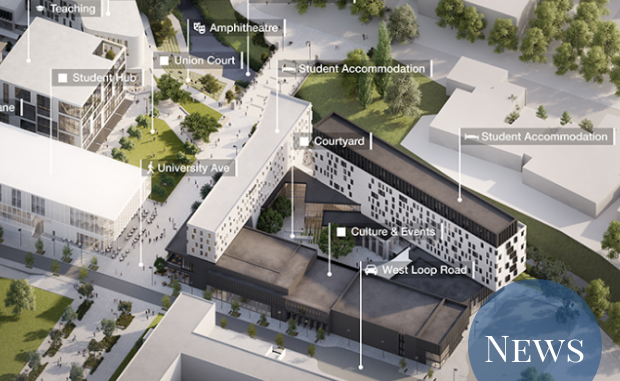 There will be a ‘Culture and Events Building’, which will house a theatre, a cinema and two multi-purpose halls. There will also be a Health and Wellbeing Centre, housing a Club Lime gym, the pool, and the NHC. Hughes-Warrington clarified that ANU Sport would continue to operate despite the new gym, stressing a need for more capacity and arguing that they would serve different audiences. The ANU Medical Centre will continue to provide services during the transition period, according to the Kambri website. Workers have started clearing a path for a creekside parkway, near where the amphitheatre will be located. Speaking to concerns about flooding, Hughes-Warrington noted they are putting a weir in as well as raising the water level with a sluice gate. She stated she is “happy” the university has“better management of the creek than when the event [flood] happened in February”. Schmidt previously told Observer the weir will help stop shopping trolleys contaminating the creek. The University has also recently begun conversations about a new library, according to Hughes-Warrington. SA7, which is located in the centre of the Kambri redevelopment and will replace Fenner, will begin at $290.00 per week. Returning students have this week received offers of accommodation for the new residential hall, which will have 450 beds. In other redevelopment news, the SA5 residential hall will be named in October, and will cost students from $288.10 per week. SA5 is currently hosting Bruce Hall. Wright Hall, which will be flexi-catered, will cost from $400 per week. Hughes- Warrington also revealed that SA8, which will be located in the currently undeveloped land beyond Burgmann, will have accommodation for families- a feature which ANU currently doesn’t possess.